Some vaping devices some form of assembly before you can start using them. However, there are others that come complete, sparing you the need for setting up. For the ones that need setup, it is important to consider how easy the process is. Beginners can use basic vaping devices, although a starter kit can be more advisable. Most vaping devices have two main parts, these being the cartomizer, and the battery pods. The cartomizer contains the coil, the drip tip, and the clearomizer while the battery pod only has the battery. You must have noticed that most vape cigarettes and vaporizers are battery powered. The power from the rechargeable battery provides heat energy, which is used to heat up the substance. Before buying an e-cig, it’s always advisable to consider how long the device’s battery is made to last. In most case, higher amperage represents a longer the battery life. Especially if you’re a bit experienced in vaping or you’ve just transitioned from smoking, you don’t want a device that dies out after only a single use and it’s the middle of the day or even in the morning and it’s a workday. In some vaping devices also, the battery is detachable, while others use an inbuilt battery. It is also really important to consider the charging system. Does the device allow for USB charging? Ease of maintenance is among the most important considerations when buying a vaping device. Whether you’re an experienced vaper or you’re only in your baby steps into vaping, you don’t want to go for something that will take you hours to clean and keep in good shape. If the description is anything close to you, go for a device that is easy to fill and has a top fill and still allows for easy cleaning of the clearomizer. The coil should also be easy to replace for those that come with a replaceable coil. When not using the device, however, it is advisable to detach the battery pod from the cartomizer to prevent leakage. This can help preserve the quality and convenience of your vaping device while keeping it easy to maintain. All the above are features designed to prevent electrical errors, some of which may result to explosion and damage of your device. Well, not all people who vape have smoked before. However, a significant number of electronic cigarette users once used to smoke traditional cigarettes. If this is you, then it’s an important consideration to make. 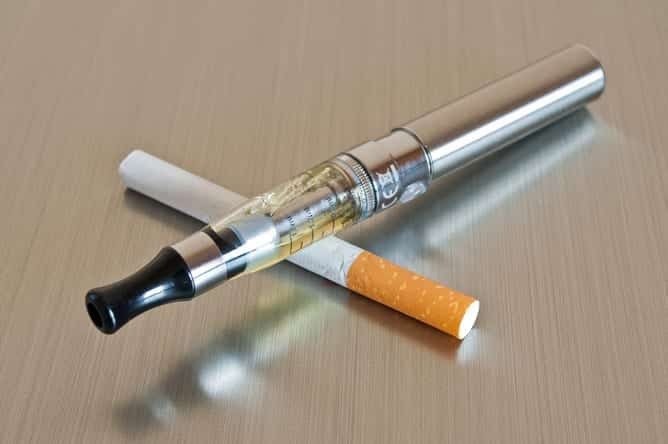 First things first, you’d want to get a vape cigarette that you can use with nicotine. There are two main device options for you. These include the direct lung; and the mouth-to-lung inhale devices. For people who’ve been smoking for long, say 20 years and above, mouth to lung inhale devices may be ideal although they may later switch. The device allows the vaper first to inhale the vapor into the mouth first, then into the lungs and gives the same feel like cigarettes. These types of vaping devices do not, however, produce a lot of vapor and majority of them are the traditional vape pens. For advanced vapers and people who’ve not been smoking cigarettes for long, the direct lung vaping devices would be preferable as they allow one to enjoy and still produce huge clouds of vapor. All the above are highly important considerations when choosing a vaping device. They’ll be helpful for you if you’re out there on the market for the best vape cigarette. And in case you chose vape mods or perhaps you’re a fan of cannabis vapes, you may also want to check out the best dab tank for vape mods while on your quest to find the best vaping device. Nonetheless, design, ease of use, convenience, presentability, safety, and cost are some of the most important things to consider. We appreciate your great article. At MaxVaping we’ve found that eJuice Company Blue Dragon has been a high seller for us since we started selling e-liquid in 2013. That e-juice manufacturer delivers consistently high-quality vape juice. Lately, Vaspetasia’s Killer Kustard has been another bestseller.